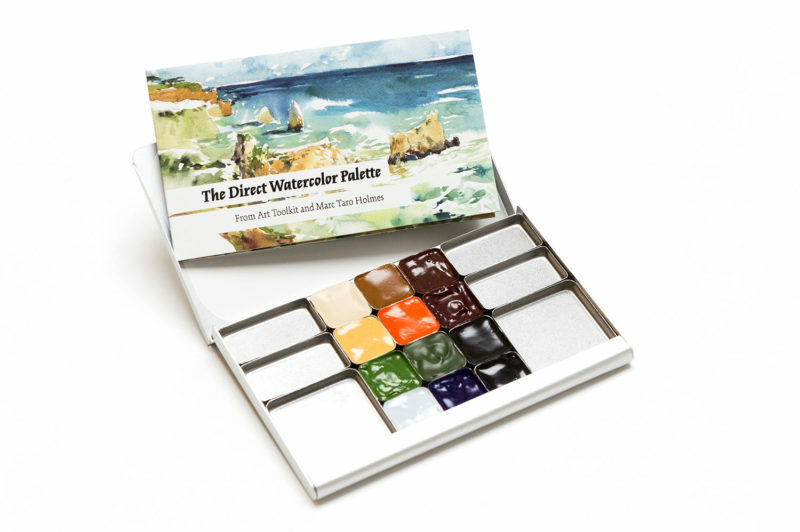 I’m happy to announce the Direct Watercolor Palette, a limited artist edition Pocket Palette created in collaboration with Marc Taro Holmes, now available in my Shop. I’m a long-time fan of Marc’s work and his Urban Sketcher book, and over the past couple of years have sent some Pocket Palettes his way to try out. 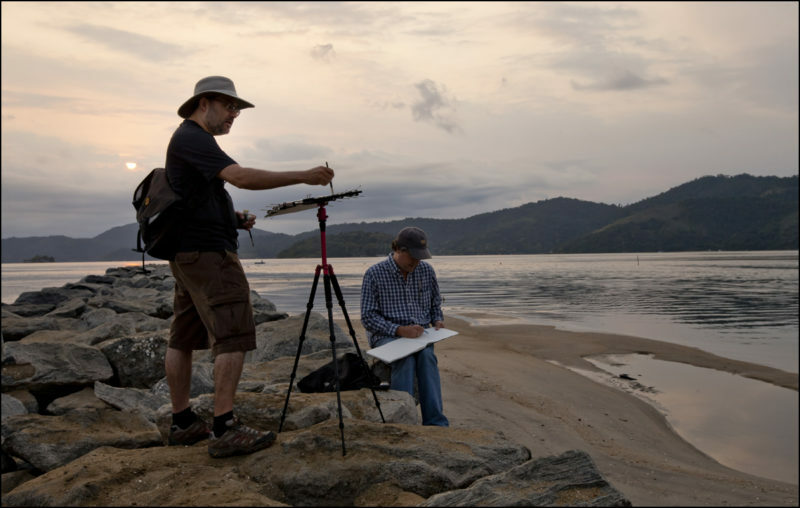 Turns out we share enthusiasms for tools and field sketching, so we decided to team up. For this palette, Marc has selected twelve of his favorite pigments, chosen for painting directly on the page with energy and spontaneity. He describes the colors as his “desert island selection,” the minimum for landscape and urban sketching. 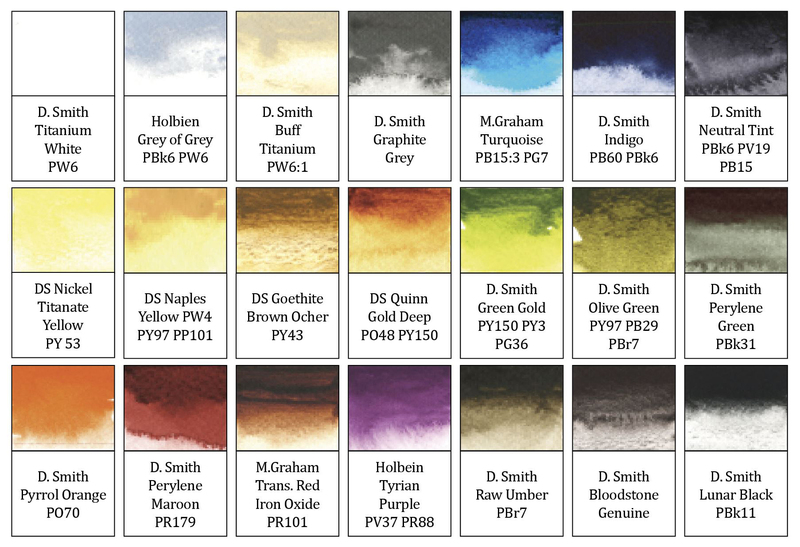 The colors include twelve mini pans filled with: Buff Titanium, Goethite, Quinacridone Gold Deep, Naples Yellow, Pyrrol Orange, Perylene Maroon, Green Gold, Olive Green, Perylene Green, Holbein Grey of Grey, Phthalo Blue Green Shade, and Neutral Tint (all Daniel Smith except for Grey of Grey). The palette is also accompanied by a tri-fold guide to the colors with mixing tips. The colors are inspired by a 21-color palette that Marc fine-tuned while working on his wonderful book, Direct Watercolor . 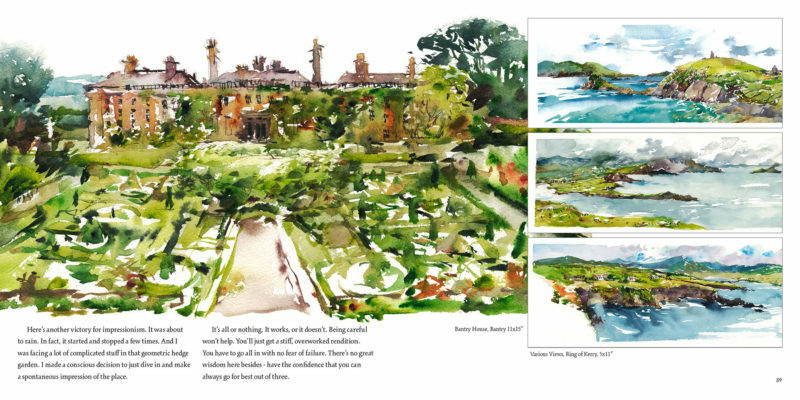 The book features his expressive watercolors alongside demonstrations and techniques. The Direct Watercolor Palette is limited in quantity so get yours while supplies last. I’ll be using this palette myself for the June 30×30 Direct Watercolor Marathon, so stay tuned to see how I put it to use, and I invite you to join the marathon as well! Thanks so much for the newsletter update. While I would love to participate in the 30 x 30 I don’t do Facebook and never will. I will check out Mark’s book as I have is other books. I will also experiment with his chosen limited palette as I have all of the colors except the Holbein and use almost all of them in my own limited palette. I have Perelene Maroon but haven’t used it. I may switch that in and see how I like it. I would love to enter your giveaway but I don’t do Instagram either. Or Twitter. I’m not a Luddite but I intentionally avoid those social media platforms that seem to have difficulty with privacy rights. I look forward to your newsletters and will catch up on blog posts I may have missed. Can’t wait to get this palette! I just ordered mine – really looking forward to it! Thanks for setting this up! You are so welcome! I hope you enjoy the palette! Will there be any chance of buying just the tri-fold guide to the colors with mixing tips that comes with this limited edition? I put together a similar set of colors in one of my regular pocket palettes. Got this palette along with another Art Toolkit. Love them ❣️ Enjoying the blue trim too. Thanks Maria. Wonderful! I’m so glad you like them! The palette looks good but your stock is all gone. Any chance of a restock? Yes! I have a restock coming soon, please email me if you’d like to be the first to know when they are available. really love what you have come out with this year. Those black pocket palettes are super-dooper cool! Thank you, Ellen! I’m so glad you are enjoying your palettes! What a great idea to use another Pocket Palette as a portable mixing palette. It gave me an excuse to buy a Black Palette, transfer my paints and use my slightly beat up silver palette as my mixer. One idea is to spray the pans with white enamel spray paint. Marc’s 28 color would be great! I think the paints to build Jane Blundell’s essentials and have done so in bigger palettes; but, I would buy both just for the convenience and neatness if you sold them! That would be awesome! Could you please list the exact dimensions of the palette. I’m assuming its the same as the pocket palette but would like to be sure. Thanks! It’s the same case as the the Pocket Palette! Approximately 3 5/8″ x 2 1/2″ (about 92mm x 64mm). When closed, it is approximately 1/4″ thick (6.4mm), and the pans are about 1/8″ deep (3mm). Full-time students and educational institutions may apply for my program. I am transitioning to plastic-free packaging for the Art Toolkit. A new color for the Art Toolkits this Spring. Announcing a special edition palette in collaboration with Jane Blundell! A beautiful 6-color palette with artisanal handmade watercolors. Now available, the six color Essential Colors Palette! The Field Sketch Palette filled with 14 handmade watercolor paints. Announcing a special collaboration with artist Samantha Dion Baker.